Pacific Coast Borax Company (1890-1956) – A mining company founded in 1890 by borax magnate Francis “Borax” Smith. Smith got his start in Mineral County, Nevada where he contracted to provide firewood to a small borax operation at nearby Columbus Marsh. Working at Teel’s Marsh he discovered borax and collected samples which assayed higher than any known sources for borate. He soon staked several claims and began his career as a borax miner. With the help of his older brother, Julius, and two brothers by the name of Storey, operations began in 1873 under the name, Smith and Storey Brothers Borax Co. Later, the Smiths acquired the Storey brothers’ interest and the company name was changed to Smith Brothers Borax Co. and later to the Teels Marsh Borax Co.
William T. Coleman, who owned the Harmony and Amargosa Borax Works, the Lila C Mine, the Furnace Creek Ranch, and other properties in Death Valley, began to have financial troubles, Smith provided Coleman with capital in exchange for mortgages on the property. Unfortunately, Coleman’s empire would collapse and Smith gained all his properties in 1890. The name of Smith’s properties then became the Pacific Coast Borax Company. The borax was shipped via the Death Valley Railroad that the company built to the east, from Ryan, California to Death Valley Junction, California. 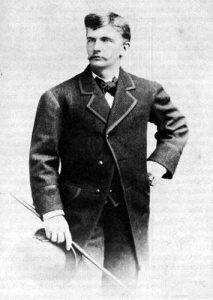 Christian B. Zabriskie joined the company in 1885, became its vice president and stayed until 1933. Zabriskie Point above Death Valley is named in his honor. As these mines began to play out, Smith developed new ones in the Calico Mountains near Yermo, California, and built the Borate and Daggett Railroad to haul product to the railhead in Daggett, California. 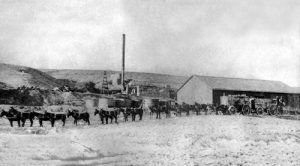 Later, Francis Smith, who had lost his fortune and control of the company in 1913, developed methods to process material from Searles Lake, building the company town of Trona, California and the Trona Railway for shipping. The company established and aggressively marketed the 20 Mule Teams Borax trademark in order to promote the sale of its product. The name derived from the 20 mule teams that William Coleman used to transport borax out of Death Valley in the 1880’s. The trademark was utilized on the Boraxo hand soap the company produced. In 1923, the company built a Civic Center in Death Valley Junction, California, which included company offices, a store, an employee dorm, a 23-room hotel, dining room, lobby, gymnasium, billiard room and ice cream parlor. 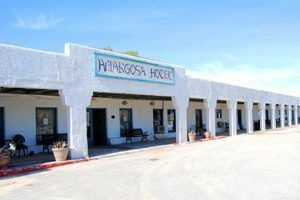 This building now serves as the Amargosa Hotel. They also built Corkhill Hall, which was used as a community center for dances, church services, movies, funerals and town meetings. This building now serves as the Amargosa Opera House. In 1926, the Pacific Coast Borax Company created a subsidiary called the Death Valley Hotel Company to construct a Mission Revival style luxury hotel near the Furnace Creek Springs in the foothills of the Funeral Mountains overlooking Death Valley. The Furnace Creek Inn opened in February, 1927, transporting people to the luxurious oasis in the desert with from the Tonopah & Tidewater Railroad at Ryan, California. In 1956, the Pacific Coast Borax Company merged with United States Potash Corporation to form U.S. Borax, which itself was acquired by the Rio Tinto Group in 1967. As a wholly owned subsidiary, the company is now known as Rio Tinto Borax and continues to supply nearly half the world’s borates. It operates the largest open-pit mine in California next to the company town of Boron, in the Mojave Desert east of Mojave, California.